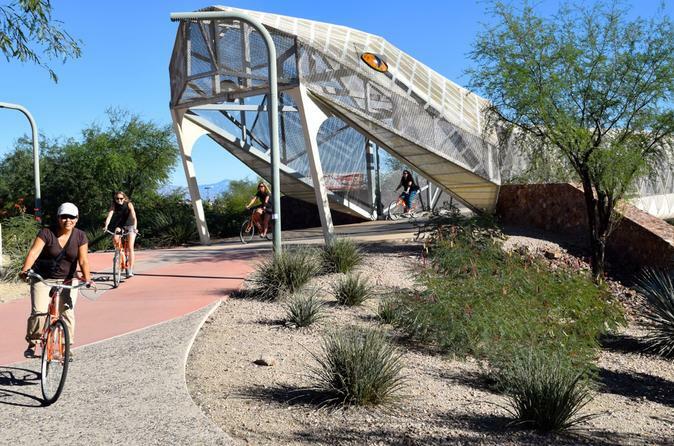 Experience why Tucson is rated as one of the best bicycling towns in the USA with a 3½ hour bike rental along the Rillito park & path. You'll have access to what locals describe as the best section of The Loop, a 131 mile network of paved paths. No hills (just 18' incline per mile! ), no cars, no kidding! Ride at your own pace: go for a challenging workout or cruise leisurely and enjoy the scenery and parks along the route. Choose between a small or large bike, which generally fit riders between 5' and 6'5". Pick either a morning or afternoon half day rental. Pickup your bike at our location across from Rillito Racetrack and Farmer's Market. For morning half day rentals, arrive between 8:45-9:15am. For afternoon rentals, arrive between 12:45-1:15pm. You'll be fitted with the correct sized bike, which includes a helmet, adjustable water bottle holder, lock, and map. We rent Civia Lowry single speed bikes, which are perfect for The Loop: comfortable, efficient, reliable, and correctly geared for the flat terrain you'll encounter (just 18' incline per mile!). We've upgraded the tires to the very best: Schwalbe Marathon Plus. After an equipment overview and safety briefing, ride away and enjoy the best section of The Loop path. To the east of our rental location, peddle up to 6 miles for beautiful views of the Catalina Mountains and Rillito wash. You might even forget you are in the city: watch for wildlife and livestock. Relax at Brandi Fenton park and check out the Binghampton historic sites. To the west of our rental location, ride up to 9 miles to Tucson's watery oasis's: Silverbell Lake and Sweetwater Wetlands. Closer in, enjoy the shade of mesquite bosques and the Sun Circle ceremonial structure. You'll have more than 30 miles of mapped out riding options to explore. Ride hard or relax. There are plenty of parks along the route with bathrooms, water, and shady areas to rest. There's even a Trader Joe's along the route if you need a snack break. The map you're provided includes a mileage chart and there is plentiful signage along the route to make tracking your progress easy. For morning half day rentals, return your bike between 12:15-12:45pm. For afternoon rentals, return between 4:15-4:45pm.